In order to better understand the variation that exists in the clinical outcomes of infants across NICUs, CPQCC is investigating the impact of a NICU’s culture and organizational context on quality of care. We have developed a tool to help individual NICUs assess their care delivery context, identify strengths and weaknesses, and help NICUs create supportive conditions for high-quality care. 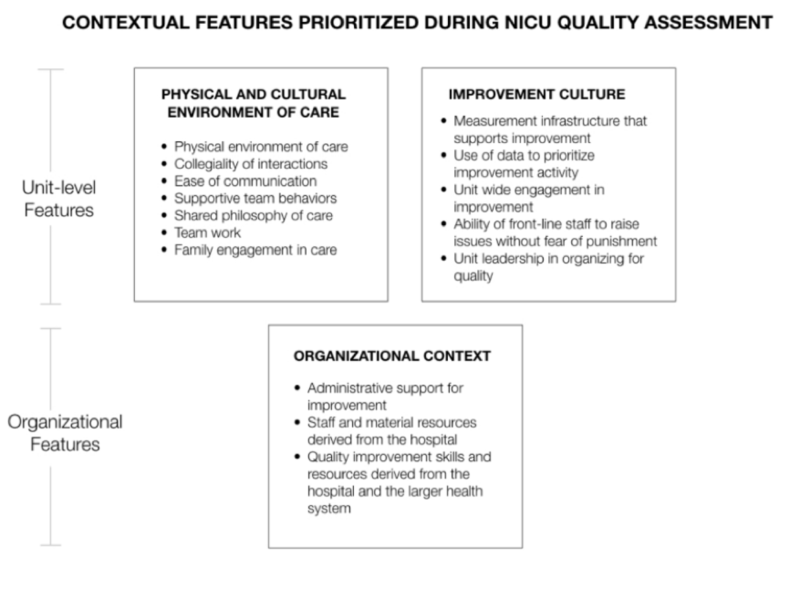 The context assessment tool is based on the results of a CPQCC study published in the Journal of Perinatology in March 2018 which identified key features at both a unit and organizational level that influence the quality of NICU care. These features include the physical and cultural environment of care, a unit’s improvement culture, and the overall organizational context including administrative and material support from the hospital. CPQCC is integrating assessment of NICU culture and context into our quality improvement collaboratives, starting with the Grow, Babies, Grow! Collaborative which launched in October 2018.